Today is Mothers’ Day- a day celebrated by many countries all over the world to recognise and honor Mothers. However, it is not the only day that I’m thankful for this precious person God has place in my life. Happy Mothers’ Day! I Love you!! When I thought of what to bake for Mum. It came instantly like one, two, three. Mum eats Mangoes everyday and I think she eats 2 a day? So this cake is inspired by her favourite fruit. I decided to go with a Mango Rose design for the top. It can be rather tedious slicing the mangoes up but it was well worth the efforts. 8) Fold remaining egg white into mixture. 9) Pour mixture in 3 separate 6″ Round tins ( I use 3 tins to bake my layers so it takes lesser time to bake). 1) Add 1 tbsp of boiling water to gelatin to soften. Stir until well mixed. 2) Whip cream with icing sugar untli soft peaks. 4) Fold whipped cream into mango puree. 1) Place one layer of cake into tin. 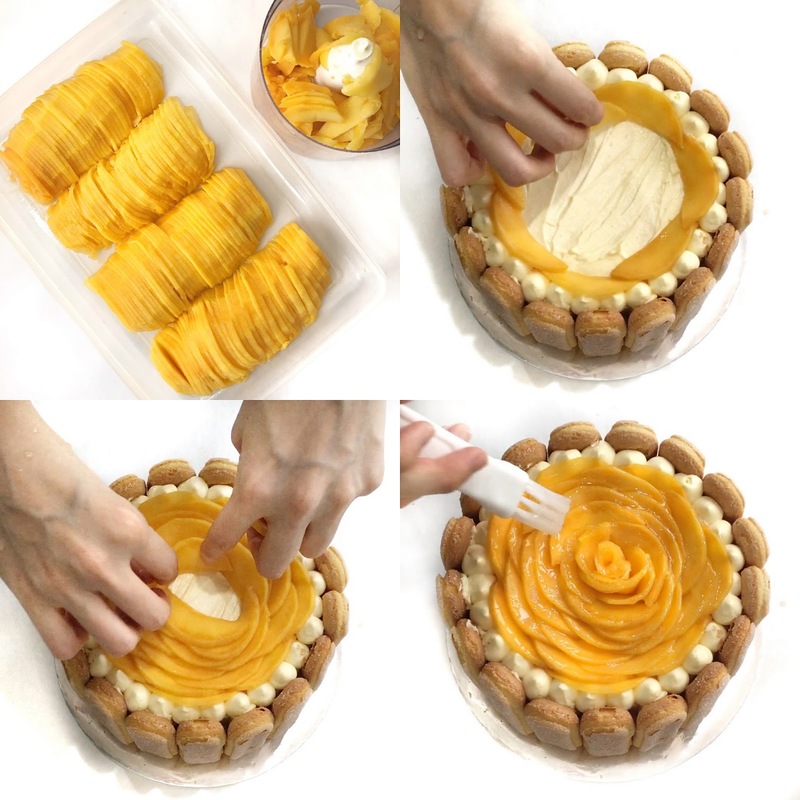 10) Add your sliced mangoes one by one , overlapping each other as you go in circles and finally ending in the middle.